Most new Legislatures in Raleigh see a few proposed amendments to the State Constitution, and this one so far is no different. Often, the proposed changes go nowhere. Maybe they are proposed by the party that's not in power, so they do not have the votes to get on the ballot. Maybe they are too contentious, so even if they are proposed by members of the party in control they do not go forward out of concern for riling up the opposition for the next election cycle. Sometimes proposed changes garner lots of media attention and mobilize large segments of society. “Amendment 1” in 2012 prohibiting gay marriage in the state was one such proposal. It mobilized social conservatives and progressives alike before passing with over 61% of the vote. Two years later it gained a second round of attention when it was effectively overturned by the courts in 2014. Other times, constitutional changes that have a major impact on society hardly get any attention at all. Last year’s change to allow criminal defendants permission to waive their right to a jury trial was all but ignored by most. According to a report by the UNC School of Government, North Carolina was the only state to not allow such a waiver and even though the amendment proposed a “fundamental change in how criminal trials may be conducted in this state” it received little attention from the media and “advocacy groups”. And then there are the proposed changes seemingly designed to help those in elected office more than anybody else. Unfortunately, two of the proposed amendments this legislative session fall into this last category. Two weeks ago, a pair of bills were filed proposing to extend the terms of Legislators from the current two year terms to four year terms. House Bill 180, sponsored mainly by House Democrats, proposes 4-year terms for Representatives and Senators with a two term limit for the leadership positions of House Speaker and Senate President Pro Tempore. Senate Bill 271 sponsored by four Republicans – including Senator Jeff Tarte of Cornelius – goes a step further by proposing 4-year “staggered” terms. Under this scheme, only half the House and Senate would be elected every two years. S271 also seeks to implement term limits for all members of the General Assembly. Legislators would be allowed up to four consecutive terms “in a legislative chamber”. It is unclear whether the term limits provision would mean a maximum of 16 consecutive years in Raleigh or potentially up to 32 years if an elected official maxed out 4 terms in each chamber. Multiple requests to Senator Tarte’s office have gone unanswered to clarify this point and include his comments on the bill for this story. Locally, debating this type of change may sound eerily familiar. Back in 2011/2012, the Town of Davidson was considering a similar change to four year staggered terms for its elected officials. If these bills go forward and make their way onto the ballot this November, you can be sure you’ll hear some of the same reasons why it is a good idea. Supporters will say it “provides stability” by reducing turnover in a given election cycle. They will tell you longer terms allow elected officials to spend more time on long-term projects rather than campaigning. They will say it will take some of the money out of politics. They will make it sound like a good idea. But here are some of the other impacts. • Four year terms for all legislators provides less accountability and a lot of time for individual members to make mischief between one election and having to face voters for reelection. • In an environment where we already have very few competitive districts due to gerrymandering, cutting the number of districts in half on the ballot in a given election cycle will further concentrate money into an even smaller number of competitive races. • Four year staggered terms makes it much more difficult for the party not in power to take over an elected body – even if those in power deserve to be ousted. It is not good for small-d democracy. In 2012 after hearing from voters, the Town of Davidson abandoned plans to make this type of change and lengthen terms for elected officials. Here’s hoping our legislature and particularly those sponsoring these bills see the light and do the same here. If legislators really want to give the public a choice on something voters may actually want, they could put a straight up term limits amendment on the ballot. However, if the price of term limits is longer terms with reduced voter impact, then the price is too high. Do local elected officials take Clinton's approach to email and public records? One might think so with the first big “scandal” of the presidential election cycle underway after the revelation that Hillary Clinton used private email for public business while she was Secretary of State in the Obama administration. The story was first reported back on March 2nd by the New York Times and has been running strong ever since. The defense from the Clinton campaign operation basically boils down to this. “Everybody does it.” Meaning, elected officials regularly use private email to conduct public business, and as long as the rules are followed there is nothing to be concerned about regarding public records law. While the Republicans are certainly using the story to score some political points, Clinton does in fact have a point herself. Everybody does it. On March 12th, the Wall Street Journal ran a story about three likely Republicans presidential candidates – Jeb Bush, Marco Rubio, and Scott Walker – who also used private email accounts while in various elected positions. So, while it is clear this story is as much about politics as it is about transparency, it does shine light on a situation that takes place at all levels of government – even here locally. Over the last couple of years while writing stories on local politics, I've made several public records requests and had a lot of interaction via email with elected officials. Here are a couple of observations. The first is that our town staffs are responsive across the board. I regularly receive a response within a few days, and at no time have I ever felt like they are stonewalling. That’s a very good thing and something I think our local Town Clerks do very well. However, they can only provide public records if they actually have them, and that brings me to the second observation. Locally, it is not at all uncommon for elected officials to use a private email account when conducting public business. Most elected officials have accounts for political campaigns. If someone sends a message to that account and it should be a public record, the official is responsible for keeping it. Other times, it is obvious that officials are primarily using non-public accounts out of convenience. You might send an email to their elected office email and get a response back from a personal or work related account. In both cases, it is basically impossible for the staff to accurately fulfills public records requests because they don't have ready access to anything stored on those private accounts. They can ask elected officials if they have anything meeting the criteria of a records request, but it is up to the elected officials to respond. My guess is the vast majority of the time use of private email accounts is completely inconsequential. However, there certainly could be times when it is not. Here are a couple of examples. For one recent request I submitted on the proposed changes to Davidson’s planning ordinance, I received an email from a local organization sent to a pair of town commissioners on their non-public accounts. One of the commissioners included it in the response to the request, the other did not. Based on the subject matter, I have no reason to believe the commissioner who did not forward it was doing so intentionally. It was probably just forgotten. On the other hand, in a request I submitted last summer regarding the I77 HOT Lanes project, the answer was a bit different. At the time, a majority of local commissioners had signed a letter to Governor McCrory asking him to delay signing any contacts for the project. In a series of emails between the four local mayors, three of the four mayors were using private email to discuss efforts to prevent this letter from commissioners from being sent. This only came up in a records request because the one mayor was using a public system. This was a very pertinent political discussion on a very important project, and it was contentious. If they had all been using private accounts would it have come up? It is impossible to know, but it certainly did not look good. So, how could our towns solve this problem going forward? Local towns could pass a policy requiring elected officials to strictly use only their public email accounts for public work. The policy could further state that In the event they receive an email on a private account regarding public business, they should forward that to their public account and only respond from there. That would remove a lot of gray area and give the public a better sense their government is operating transparently. Anyone want to take a bet on on that happening? End of an era in Davidson...Leamon Brice announces retirement. Rumors had been swirling for several months regarding the possible retirement of Davidson’s long-time town manager, Leamon Brice, and on Tuesday evening they were finally put to rest. Brice revealed his plans at the beginning of the regular monthly meeting – announcing the end of the tenure of the one and only town manager Davidson has ever had. And what a tenure of service is has been. In April, Brice will have served the Town of Davidson for 25 years. Brice is already by far the longest serving municipal town manger in Mecklenburg county and when he officially retires in December he will be one of the longest serving managers in the State of North Carolina. I had previously asked Rob Shepherd with the North Carolina League of Municipalities how Brice’s tenure stacked up against other managers in the state. Brice came to Davidson in April of 1990 after serving stints in town management in the small North Carolina towns of Plymouth and Fairmont. Compared to those towns which have remained relatively unchanged over the last 25 years, Davidson has experienced massive growth over that period. In 1990, Davidson had a population of just over 4,000. Today, the population tops 12,000 and is set to grow significantly more in coming years. As part of town efforts to limit and control the growth that has occurred, Brice has led the town through multiple regulatory and planning efforts. The town has done an admirable job of protecting its small town character during Brice's tenure through efforts such as the developing the initial town Planning Ordinance, a Comprehensive Plan, and building out an award winning planning department. Brice certainly deserves credit for those accomplishments. However, as can be expected over such a long tenure, not everything has gone quite as planned. 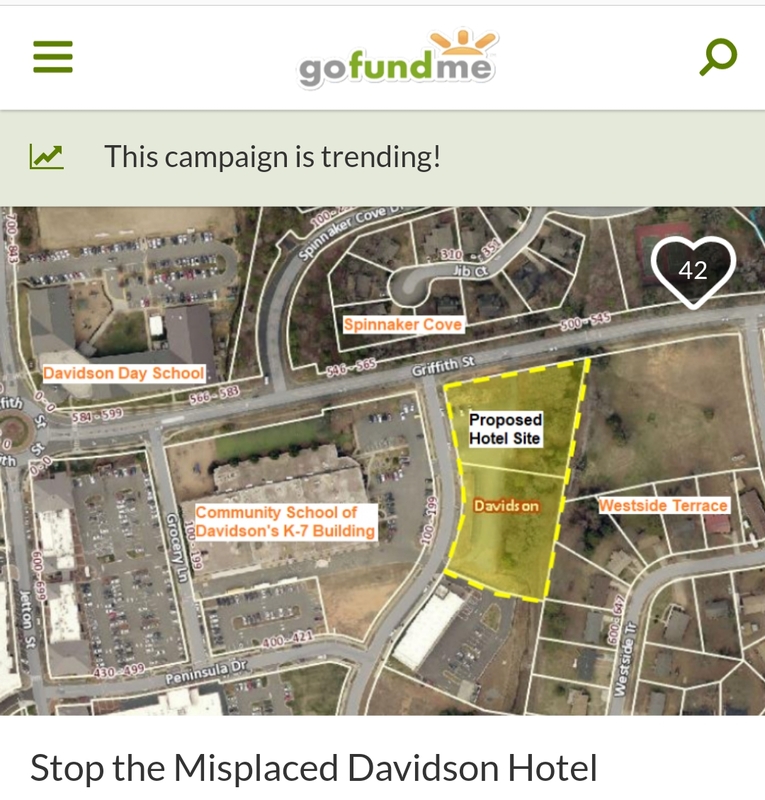 In 2001, Davidson passed an Adequate Public Facilities Ordinance (APFO) in an attempt to pass back more of the costs of additional development to the actual developers. By 2013, after a string of legal challenges across the state as well as one here locally against the developers of the Summers Walk neighborhood, Davidson saw the writing on the wall and repealed the ordinance. 2001 also saw Davidson implement one of the only mandatory Affordable Housing ordinances in the state. After 14 years, the Affordable Housing ordinance has generated just 56 for sale units with many of those selling to people with incomes over the maximum thresholds. Town staff is currently undergoing a major revamping of the ordinance in an attempt to make it effective. These ordinances are the subjects of a current lawsuit seeking to invalidate the Affordable Housing policy and to receive compensation for previous APFO payments. Then of course there is Mi-Connection. Back in 2007, as town manager Brice played a central role for the town in the creation of the locally owned cable company that has become a constant drain on town coffers. Last week’s column told readers about some good news for the company with the possibility of improving the financing on the bulk of its outstanding debt. Hopefully, by the time Brice actually retires later this year that frustrating problem will be further along the path to resolution. It would be a nice way to go out and leave the town in a better financial position than over the last few years. certainly deserves recognition for his long tenure and for his contributions to what makes Davidson special. It's not common these days to stay in one place for such a long time, and in many ways that continuity has been valuable. When you see him around town over the coming months, thank him for his service. He deserves it. However, as Davidson’s Board begins the process of finding a new town manager with the goal of doing so by October, the Board should commit to going outside of town hall for Brice's replacement. With all of the challenges facing Davidson in coming years as growth continues, the town will benefit from the opportunity of having a completely new set of eyes looking at them. March is here. Let the Madness begin! In a departure from the usual topics covered here, I've just got to say what an awesome basketball season it has been! March Madness promises to be an exciting one. Growing up in Louisville, Ky during the seventies and eighties I as a huge UofL fan. Having the Cards in the ACC has brought back a lot of the interest I'd lost in college basketball. Add to that my alma mater, UVA, dominating the league for the second year straight, and I can say I'm fully back in 'fan' mode. So to say the least, I was absolutely torn watching my UofL Cardinals play my UVA Cavaliers Saturday night. The ending was appropriate with both teams hitting last second shots leaving me feeling both happy and disappointed for both teams in a matter of seconds. Louisville won that game 59 - 57 handing the Cavaliers only their second loss all season. And the there is Davidson. The Wildcats have ended the regular season in spectacular fashion - handing VCU a stunning defeat in Belk arena on Thursday and following that up with a crushing road win against Duquesne on Saturday. Judging by what the basketball pundits are saying, that should be enough to secure Davidson it's first ever at-large bid to the NCAA tournament. If it wasn't for the two "bad" losses on their record - St Joseph and St Boneventure - there would be no doubt about it at this point. But in case the selection committee needs any more encouragement to give Davidson a spot, here is a stat that I hope they take into consideration. Davidson is one of only two teams this season to score more than 70 points against the smothering Virginia defense. They scored 72 in their loss to UVA back in December. They were the first team to achieve that, and after destroying the famed VCU Havoc defense this past week, they've proven they can score against just about anybody. That's the kind of team you want in the tournament. After winning the A10 in its first year in the conference, what Coach McKillop and the team have done really deserves some national attention. McKillop should be on the list of candidates for NCAA Coach of the Year. Not having him there is a big miss in my opinion. For a look back on the Wildcats season so far, check out this interview with Coach McKillop on Sunday. The rest of March promises to be exciting!!! Possible good news on the horizon for Mi-Connection? If you've been watching the news much lately, you are probably aware the Federal Communication Commission (FCC) has been looking for more ways to control the internet from the Federal level. One of those moves came last week when the FCC granted a petition from Wilson, NC to preempt a North Carolina law that puts conditions on municipal ownership of broadband networks. The state legislation, commonly called the Level playing Field Law, was passed in 2011 and does things like limit the footprints of publicly owned networks to municipal boundaries, require voter referendums before funding ventures into the highly competitive telecommunications industry, and limit the ability of a publicly subsidized networks from undercutting prices of private sector networks. Even though Mi-Connection is the poster child for why a law like this is needed – its purchase was done without a referendum and minus the tens of millions in taxpayer funded subsidies the company surely would have gone under as a private sector operation – both Davidson and Mooresville supported the FCC action. Last year, each town submitted official comments of support for Wilson’s petition. In light of all the company’s challenges over the years, it is somewhat ironic that the towns supported the FCC action. That irony is made even more pointed because Mi-Connection is actually exempted from most provisions of the state law in question as a pre-existing network when the law was passed. Even the one provision that may have impacted the company – the limit on service boundaries - was irrelevant. No, the FCC action is not why there is something positive on the horizon for Mi-Connection. It really does nothing for the company one way or the other. Instead, the potentially positive turn of events originates much closer to home with activity in the office of Mooresville’s finance director, Deborah Hockett. Ms Hockett has been looking at refinancing the outstanding debt for the company and has been making some real progress. However, as good as that news may be, it pales in comparison to what might be saved if an even bigger financial transaction occurs. For years, the taxpayers who have been subsidizing the operation have always heard that “there’s nothing that can be done about Mi-Connection until 2017” because of the bonds that were used to buy the company. Well, it turns out, that is not entirely true. Yes, much the bonds could not be refunded early without penalty because they have a 10-year call provision – meaning they can't be refunded within the first 10 years. However, now that we are much closer to the call date and interest rates have dropped enough it may be financially doable to refund a big chunk of the existing bonds and reissue new bonds at a lower rate. About $61 million of the original $80 million in principal falls into this category with interest rates in the 4-5.1% range. Mooresville has already begun the process to see if something can be worked out to refinance this portion of the debt. The town enlisted Southwest Financial Advisors on an RFP for underwriters to conduct the transaction. If that goes well, the town needs to get on the Local Government Commission’s schedule for approval to issue the new bonds. That could happen as quickly as April or May. While there certainly are no guarantees and financial markets can change quickly, if all goes well, the towns could be seeing some significant savings as early as the next budget cycle scheduled to wrap up by the end of June. Let’s all cross our fingers and wish Ms Hockett success in what she is trying to accomplish. That, more than anything done or not done in Washington or in Raleigh, will help Mi-Connection gain sounder financial footing. Tomorrow is the big day in the long fight against tolling I77 with HOT lanes. Wideni77.org has their day in court with a hearing on their motions asking for an injunction against the project. This could go one of a few ways. The group could get a temporary injunction - halting the project while it works its way through court.w. The project could be allowed to go forward while the court proceedings continue to trial. Or, the groups case could effectively be thrown out by the judge. Obviously, the activist group is hoping for an injunction. What would be interesting to watch will be what happens if they receive no injunction, but the case is allowed to go forward. How will something like that effect the outstanding financing efforts? Cintra, the Spanish firm with the contract for the project, has not finalized how it will pay for the project, and it will be interesting to watch how a court case hanging over the project impacts that effort. Charlotte, N.C. – (February 25, 2015) - The Honorable W. Osmond Smith, III, Senior Resident Superior Court Judge in Judicial District 9A (Caswell and Person Counties) has been appointed to hear the complaint of WidenI77 (Plaintiff) v. N.C. DOT and I-77 Mobility Partners, LLC (Defendants). Judge Smith will be hearing the Motions with regard to the temporary injunction to stop the I-77 Toll Lane Project at the Alamance County Historic Courthouse in Graham, N.C. on Tuesday, March 3, 2015 at 9:30 a.m.
WidenI77 and our team of attorneys led by Matt Arnold Esq. of Arnold & Smith, PLLC (www.ArnoldSmithLaw.com ) are pleased to have the opportunity to present WidenI77’s case to Judge Smith. WidenI77 would like to invite our friends and supporters to join us in Graham to observe the hearing and to show support. See our website for more information on the trip to Graham Tuesday morning, March 3rd.